If you are searching for lawn installation in Garner North Carolina, then Jason's Quality Landscaping, Inc. is the company to call. Since 1994, Jason's Quality Landscaping, Inc. has been installing lawns in Garner and surrounding areas. Our staff will provide you with a free initial consultation, explain the various turf options to you and install your new lawn on a schedule favorable to you. 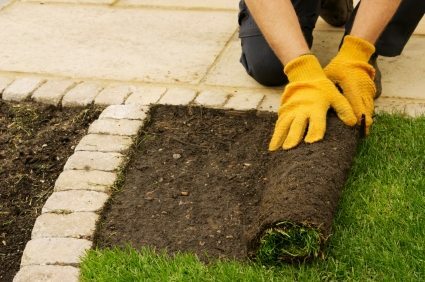 Many people choose the Garner lawn installation services of Jason's Quality Landscaping, Inc. because we have a great reputation due to the excellent service which we provide. When you hire a Garner lawn installation company, you don’t just want a company to come out and put down any old piece of turf. You want a company which goes over your options with you and helps you to choose a turf variety which is best for your individual yard. We will walk through the process with you and get you the results you want. When you choose the Garner North Carolina lawn installation services of Jason's Quality Landscaping, Inc. you will have the opportunity to deal with our attentive staff. We know that you may have questions along the way and we will be there to answer those questions for you when you do. Our Garner lawn installation services are also reasonably priced which is sure to put a smile on your face. You will love the competitive prices offered by Jason's Quality Landscaping, Inc. and enjoy the fact that you get so much for your money when you choose us to be your premier lawn installation company. Not only do our prices include the lawn installation itself but the consultations, products and so much more. Lawn installation makes your yard look fantastic and allows you to have the lush, beautiful Garner North Carolina yard you have always wanted. Sometimes lawn installation is the only way for homeowners and business owners to get that eye-catching green lawn they desire and we can help you achieve this goal. Call Jason's Quality Landscaping, Inc. at (919) 214-9134 and let us meet all of your lawn installation needs.